Hydraulic jacks are devices that have countless applications. This type of jack is used in the automotive industry to lift cars above ground level so they can be tooled. Many tools in the construction industry utilize hydraulic jacks to complete tasks. These jacks operate under “Pascal’s Principle.” Essentially, applying pressure in a certain way will yield the application of pressure in another way. According to PhysLink, hydraulic jacks work under the concept that in a closed container, pressure is the same at every point (Pascal’s Principle). Hydraulic jacks consist of two cylinders, one larger than the other, connected together. Applying force to fluid in a cylinder exerts pressure throughout the volume and against the surface of the cylinder. This addition of force to a smaller cylinder makes it possible to generate even more force from a larger cylinder. For example, when a one-square-inch piston applies one pound of pressure to a hydraulic fluid, the pressure provided to the fluid is equal to one pound per square inch. A ten square inch piston connected to this system produces the force of one pound per square inch times ten or, ten pounds, according to PhysLink. However, when the smaller piston is forced ten inches in a direction, the larger piston will only be forced one inch in another direction. All hydraulic jacks consist of at least six main components, according to Hydraulic Jacks. The main components of hydraulic jacks include a reservoir, pump, check valve, main cylinder, ram piston and release valve. The reservoir holds hydraulic fluid; the pump pulls fluid from the reservoir to the check valve, which directs pressurized fluid to the main cylinder. The main cylinder houses the ram piston, which is forced out by the pressurized fluid. A hydraulic pump’s release valve releases pressure to allow the ram piston to retract. 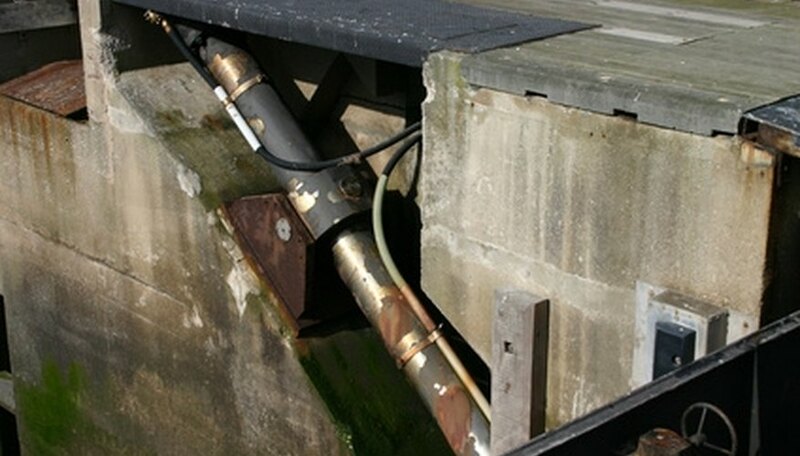 Properly maintaining hydraulic jacks is vital to keep them properly functioning. The only way to keep the seals on a hydraulic jack from prematurely deteriorating is to keep them from getting exposed to the elements. Covers can be employed over hydraulic jacks to keep them from accumulating dust and debris. According to Hydraulic Jacks, ram pistons should always be stored in the “retracted” position. Many different fluids can be used in hydraulic jacks however it is recommended that brake fluid never be employed in hydraulic jacks as it can destroy seals. Consumers can purchase hydraulic jacks that are capable of lifting objects that weigh a few pounds to several thousand pounds. According to Hydraulic Jacks, the four types of power sources for hydraulic jacks include compressed air, electricity, gasoline, and hand power. Hand-powered hydraulic pumps are the cheapest but slowest types of hydraulic pumps on the market. Leone, Jay. "Hydraulic Jack Information." Sciencing, https://sciencing.com/hydraulic-jack-information-6611630.html. 24 April 2017.